This Drum Rack integrates Addictive Drums 2 into Push’s drum layout, enabling you to use the step sequencer like you would with any other Drum Rack preset. Use a compact drumkit with 16 drum pads in Push’s Loop Selector and 16 Velocities layouts, or go to the 64 Pads layout to use all of the pads for additional snare, hihat, toms, rides, cymbals and flexis hits. This MIDI Effect Rack offers 8 Macro knobs which make it possible to easily control velocity values of incoming MIDI notes. Use the “Main Intensity” knob to control the entire drumkit at once, or use the 7 other knobs to control each of the kit pieces separately. Turn down a knob to get softer drum sounds, or turn it up for them to intensify. Similar to Intensity Control, this MIDI Effect Rack has 8 Macro knobs that offer control over the randomness that’s applied to velocity values of incoming MIDI notes. The higher the value on the knob, the more random the velocity output becomes, resulting in samples with different intensities being triggered in Addictive Drums 2. The Ghost Note Generator creates ghost notes at random in a controlled environment. Use the length of MIDI notes to determine which notes may receive additional ghost notes for the duration of the initial note, and use the Chain Mute buttons on the right to determine which kit pieces are allowed to produce ghost notes in general. The Macro knobs control the max velocity output and disperse generated ghost notes. The mixer in the Session View offers volume controls of all different kit pieces, while all the routing of audio and MIDI happens in collapsed tracks, out of view. The AD2 Suite comes with a project file from which you can easily import the entire Drum Rack channel into an existing project. 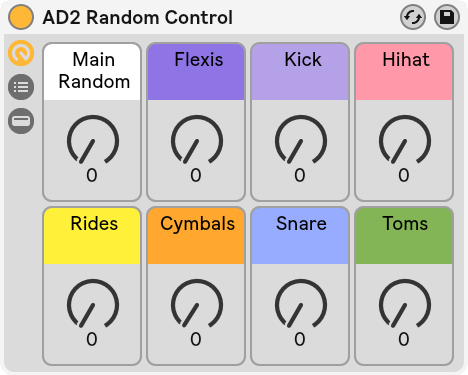 The AD2 Push Layout is configured to work with any Addictive Drums 2 kit, as long as the MIDI Map Preset inside the plugin is set to “AD2 Standard”. The Addictive Drums plugin in the project file has an empty kit loaded by default, meaning you can build your kit from the ground up, or switch to one of your favourite preset kits. * Ghost Note Generator uses a Max for Live MIDI LFO. If you do not own Max for Live, see the manual for a workaround.